This weekend was absolutely exhausting. It's what I get for complaining last weekend about being stuck in my apartment. My motto this weekend was Go with the Flow! Yes-man style. Saturday night, I was thankfully holed up in my apartment, blogging and watching a movie (Diary of a Wimpy Kid 2, if you must know...). Sunday was so long, though! I woke up at 9am, and had to get out the door by 10am. If you know me, you know that I usually require over an hour (at least!) to get completely ready for my day, including hair, makeup, breakfast, and finishing touches. So, waking up a bit late on Sunday put me in a rush. I skipped breakfast since Tab and I had plans to get an earlier lunch. We walk down the road towards the Itaewon Methodist Church. Tab said she had looked up service times, and there was an 11:00am English service. We finally get there, figure out which door to go in, and head up the elevator. I got a little suspicious when we were in the elevator with 6 old Koreans, and no other white people. We walked out, and saw a man in a suit that looked to be a greeter. I think he asked if we were lost? (I could be remembering incorrectly, but he definitely assumed we were not in the right place). Tab asked "English Church?" and he responded "Oh, it's over. It was 9am!" I look at the sign right next to us and see, sure enough, English - 9am. Korean - 11am. Guess the internet is not always our best friend and most accurate source of information! Tab was upset about this setback, but honestly, we were almost 20 minutes late by now, anyway. I said we will just try again next week; let's get some food. Before we could do that, I needed to go pick up a package Kristen sent me (my ZTA big sister who lives in NYC), and one from my mom. When that was accomplished, we set out to find food! Unfortunately, neither of us had done any research about where to go, so we attempted to find WiFi to get us on the right track. After a brief stint at McDonald's with no luck, we decided to just wing it. We walked down the street, and I made the impulsive decision to turn down an interesting looking alley. We walked and gawked at the different wares being sold outside the ecclectic neighborhood. It was cute... and then it got residential. I had a vague sense of where we were at, and expected us to come out on the main street. Well, after another 10 minutes of walking, I decided we were definitely not going in the direction. We cut and curved back in the general direction we came from, although going through different streets. Finally we saw familiar sights and knew we were not lost for good. While I was mildly freaking out, Tab was taking photos of the little houses and the view... at least she was in a good mood and not blaming me for having to hike up about 10 hills! We finally got to the alley which I expected us to originally come out at, and I saw a restaurant whose name I recognized from expat blogs: Wolfhound Irish Pub. We made a beeline, starving and tired. When we were seated at the wooden bench style table, we went over the menu. Tab decided on an English breakfast, and I went with fish and chips. (Interesting we decided on British fare when in an Irish pub in South Korea!) My fish and chips was pretty good, but nothing too special. We got there and I ended up getting some great blush-colored tailor pleated pants, some tights, and a couple clearance things. After that, we headed to meet the Craigstlist guy. I asked him would the table be one piece, or broken down. He said it breaks down, and was carriable, but a little awkward. After much debate, Tab and I decided to carry it together to her place. 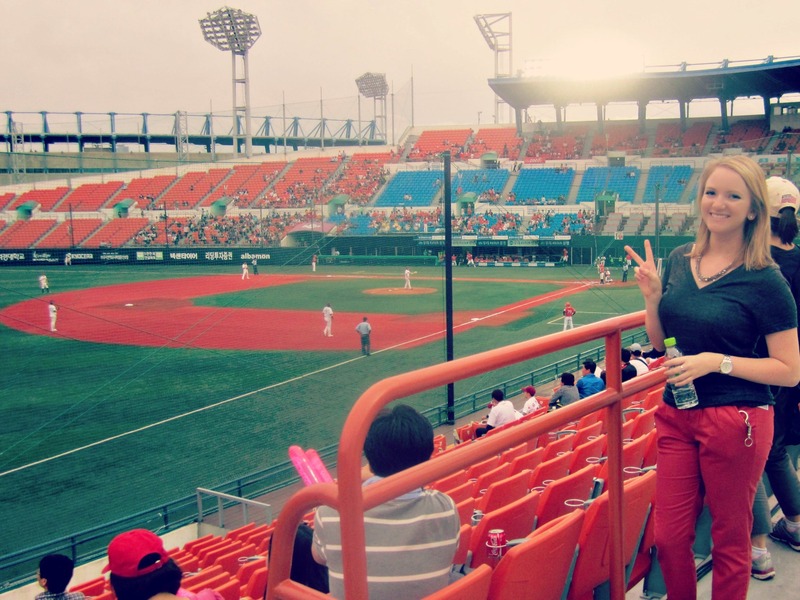 We had plans to go to a baseball game in the evening with some of her friends, so rather than take the table to my place then rush back to go to the game, we would just leave the table at her place during the game, and I could take it back afterwards. This worked out well enough, but was pretty annoying and cumbersome. We rested for about 30 minutes at Tab's, then headed to the stadium. 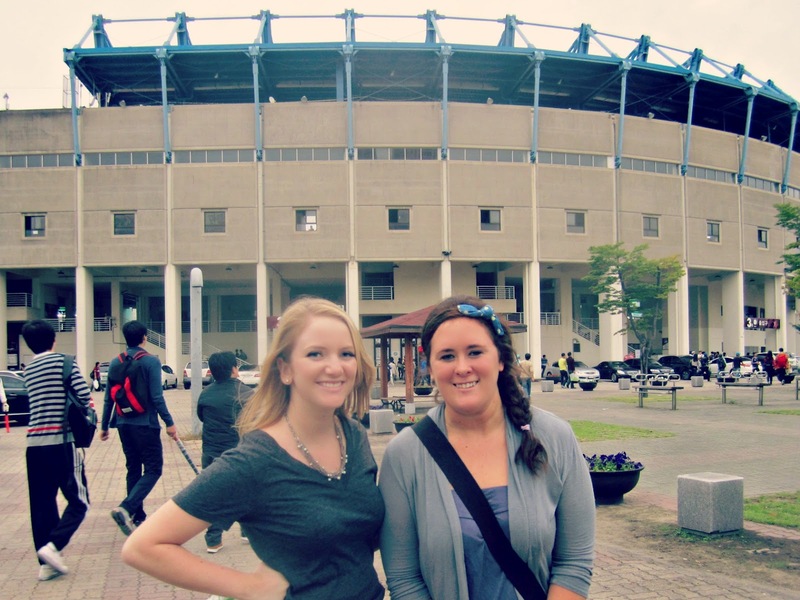 Luckily, Tab lives very close to the Seoul Sports Complex and we didn't have to trek all over Seoul to get there. One bus ride later, we were at the stadium. We got our tickets ($17) and headed inside. Apparently, unlike American stadiums which use the health code as an excuse to exploit the hungry and thirsty fans, Korea lets you take your own food and drink into the stadium! There were vendors outside selling pizza and chicken in a box (literally). 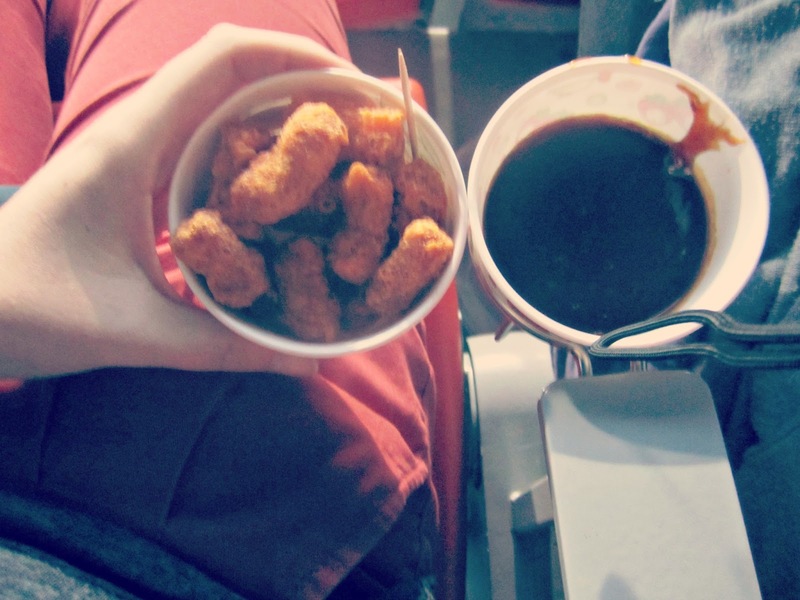 We passed in favor of getting smaller portions inside the stadium. Tab ended up getting a hotdog (a welcome surprise she wasn't expecting), and we both got some beers (which were also much more affordable than in the states at $2.50 a pop). We got our seats with the rest of the group, and settled in for some great American past time! A few things popped out at me - 1) Rather than straight up cheering, the fans of each team had songs they sang during the time their players were at bat. 2) Similar to what the Aggies have at Texas A&M, there seemed to be a yell leader who directed the crowds in songs, dances, and other general hooliganisms. 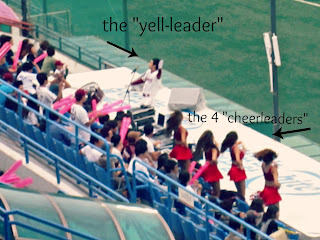 3) There were cheerleaders. 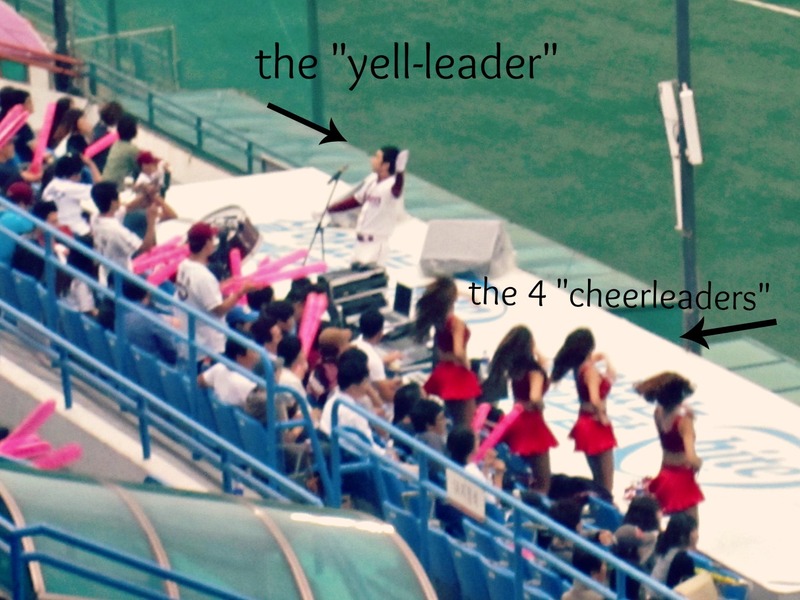 Well, not really cheerleaders - more like hybrid dancer-backup singers. They had quite conservative dances (compared to the American standard), and while they showed their stomachs, their necklines were so high even the Pope wouldn't have been able to complain. 4) While I still have not figured out the system on which Korean baseball is based and played, I figured out that anyone can play on these teams. I figured this out when I looked up at the pitcher, then leaned over to Tab and whispered: "Is it just me, or is that pitcher black?!" Now, you can't call me a racist - there are literally no black Koreans. It just doesn't happen. Some of my American readers may not be able to understand this, since in America you get called a racist for anything. But seriously! It is not possible to be black, and be Korean. 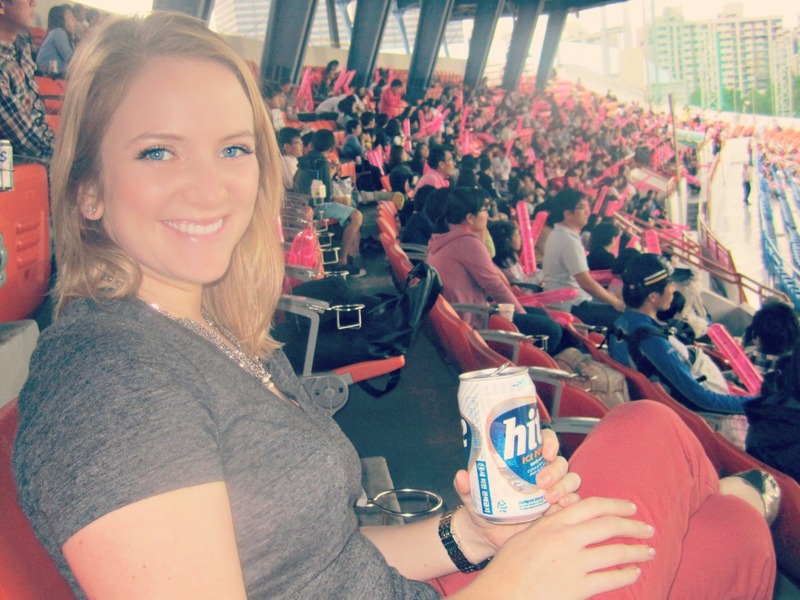 While being an "American" is a question of citizenship, being a "Korean" is a matter of race. Therefore, someone being black and being Korean are mutually exclusive. Okay, off my defensive soapbox. 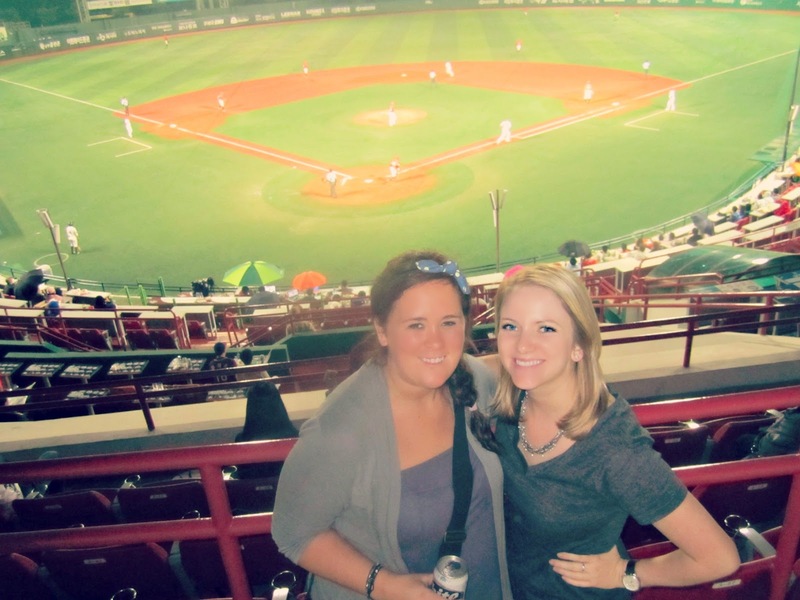 We kicked back and enjoyed the people watching, and of course the sport of baseball. Apparently, we were rooting for the wrong team, since it was a shut out. The other team won, and their fans seemed to have a better time overall as well. If we had not been in a group, Tab and I would have traded allegiances and gone over to the other side. But, alas, we mostly observed. Halfway through, Tab insisted that I eat something, having had nothing since noon, and been drinking a beer. I agreed to go check out the fare. I ended up deciding on some chicken. I would call them nuggets, but a better word would be pellets. Not like rat droppings, but more like short Cheetos. Does this give you a good idea? They came with a sauce, but I opted to have that on the side. All of my skeptics who think I should have eaten the dumpling last week, you will be proud. Rather than dissecting the "chicken" to confirm it's variety, I just bit into it. It was cold, but otherwise not bad tasting. I looked at the other side which I still held in my hand. It didn't look like chicken. I smelled it, then had a recollection that Koreans like dark meat chicken, rather than white. I shrugged and popped the other half in my mouth. This was quite an accomplishment. I didn't eat the whole cupful, but I did eat quite a bit. I even tried the sauce, and enjoyed it! 3)Have Tab assist me on the subway then she can turn around without having to pay for an additional ride back home, then take a cab a short distance to my apartment. This last option seemed to have both the financial and physical aspects under control, so that's what we decided to do. I carried the heavy part this time (Tab had it last time), and we headed out into the rain (which started as soon as we left the baseball game), on the bus, through the subway station, onto the trains, and out. Tab said goodbye, and I was burdened with the entire thing. This consisted of 1 large tabletop (not actually large, but bigger than was comfortable), which bent together but not all the way, only until a 45° angle remained. Also, 2 rectangular sets of metal bars, plus another 2 straight bars in a bag with the hardware. I wish I had a photo, because I must have looked ridiculous carrying this through the subway. It was slow-goings, to be sure. I was actually kind of disgusted with the lack of assistance. Everyone felt it appropriate to stop and stare at me, but no one felt the need to help me take it even a short ways, up the stairs maybe, or to the end of the hallway. Maybe it's just that I grew up in the South and therefore most men have some sort of gentlemanly blood, but I was not impressed with the Koreans at that point in time. When I finally got the thing to the top of the subway, I was totally dejected to find there were no cabs waiting at the curb (a frequent habit of empty cabs). I saw a boy, and asked where I could get a cab. He pointed across the street and I headed that way. He was just standing around and I couldn't believe he wouldn't help me, even when he knew I was only going across the street. I hobble over and the one available cab gets taken right before my eyes. I want to cry, but keep it together. And then, like a ray of sunshine beaming down through the night sky, a yellow cab pulled right up to me and popped it's trunk. I gratefully put the table down into the trunk, and get in the cab. My hands are shaking and my body slumps into the seat. All I can manage is "Kamsahamnida, Kamsahamnida, Kamsahamnida!" (Thank you, thank you, thank you!). He smiles and laughs, and I give him my address. He types it in, and we're off. We get to my neighborhood, and I live on a one-way street. This guy goes in the wrong way and pulls me up RIGHT next to my door. I was so happy I could cry. I thanked him profusely and got the table out of the trunk. When he left, I was shuffling up the driveway to the entrance, and saw my landlord. I wouldn't be able to open the door with the table in my hands, so I give him my most desperate eyes and look at the door and back. He gets the hint, comes and opens the door. Then he does one better, and takes the table top from me, gets in the elevator with me, and takes it to my room. I wanted to hug him. After that, I relaxed and then, I have no idea how I got the energy, but I put that dang table back together. I still don't know how I did it, but it's put together and I love it. It was worth the horrible time transporting it, I'm happy to say. My Sunday was so exciting and jam-packed that my Monday is utterly boring in comparison. Today, Typhoon Sanba was supposed to hit. Well, I guess it did. It was pretty rainy and windy this morning. But work was not cancelled, so I sported my rain boots. It was pretty chilly, too. I loved it. After work, I got some groceries and I am happy to say I found some decent veggies!!! I got home and made some awesome pasta and chicken. Now, my bed is calling me and another day of work is at my door tomorrow. Happy Monday, Blogosphere!